Coriander, Chilly, Dry Mango, Cumin, Tej Patta, Black Pepper, Fennel, Salt, Dry Ginger, Black Salt, Asafoetida, Mustard, Cinamon, Clove Turmeric, Big Cardamom, Nutmeg, Mace, Fenugreek. 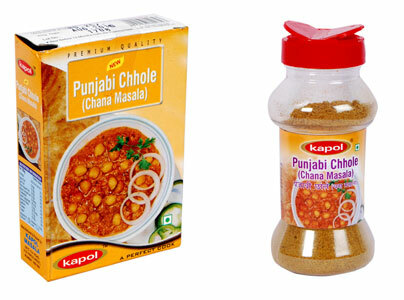 Soak kabuli chana Overnight add soda (1/2 tsp.) salt to taste and boil. Grind to paste 4 onions, small ginger 6/7 garlic sticks, 2 Tomatoes and 2-3 green chilies - add 1tsp each of corianders, chilly powder and 3 Tbspn of KAPOL PUNJABI CHHOLE MASALA. Feny and heat 10-12 minutes with 5 Tbspn of oil. Boil water salt chana and above mixer for 10-15 minutes which makes chhole ready to eat . While serving decorate the chhole dish with coriander leaves lime, onion and tomato slices.